Minecraft is definitely one of the top selling games of all time, selling over 33 million copies across all systems it is on. 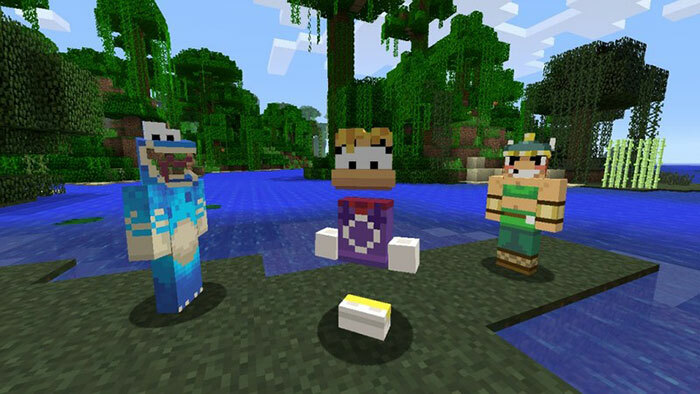 Up until recently, Minecraft was only available on the PC, Xbox 360 and mobile devices; however, Sony has now announced that Minecraft will finally hit Sony systems, including the PlayStation 4. The port of the game will be handled by 4J Studios, the team behind previous Minecraft console ports. The premise behind Minecraft is simple: anything in the world can be destroyed and you can use what you destroy to build new structures. For example, dig up the ground beneath you and use that ground to build a house. With over 50 different building blocks, anything you imagine in Minecraft you can build. There is no limit on what you can build outside of your own imagination, with players building amazing looking castles, statues and replicas of real-life buildings. Not only can you build high into the clouds, you can also dig deep below the earth, uncovering vast networks of caves complete with rivers of lava. 4J Studios have confirmed that Minecraft will be a straight port of the PC version with little to no changes to the core gameplay. The game will include all the latest changes found in the PC version up to the most recent patch. Like an MMO, Minecraft features a crafting system that gives you a wider array of items and tools to work with. For example, destroying a tree gets you wood, which you can then use to forge a pickaxe. While crafting can make basic items, such as pickaxes, swords and armor, you can also use the crafting system to make boats, minecarts, ladders and even decorative items like paintings and bookcases. Minecraft features over 100 items to craft and use, giving you a reason to explore the world and dig as much as you can. When the sun sets, the monsters come out, with over 15 enemy types ready to destroy you when day turns to night. Enemies shoot projectiles at you, charge at you and, in some cases, explode themselves to destroy not only you but everything around you. Swords and bows let you defend yourself from these creatures of the night while armor lets you take more abuse before dying. When you die, you drop all items in your inventory so staying alive is imperative. Underground, monsters can be found at any time as they thrive on the cold darkness of the vast cavern system. Sometimes you may even find a dungeon complete with a set of rewards for the adventurer who can see it through to the end. Minecraft for the PS4 will include the multiplayer modes found in other versions of the game, letting you and a few of your friends build and explore together. It has been confirmed the game will offer both private and public servers, similar to the PC version of the game. 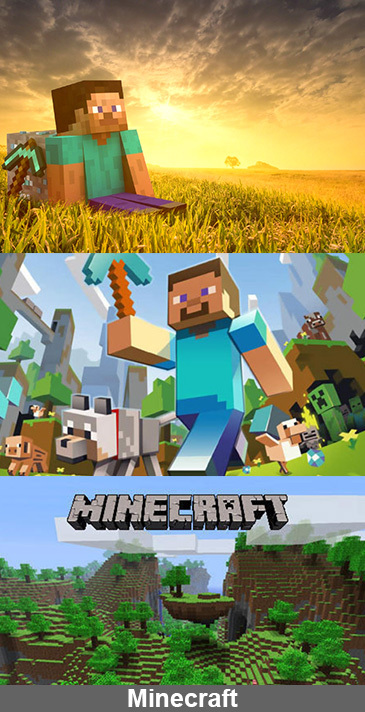 4J Studios has confirmed that the PlayStation 4 version of Minecraft will feature better textures than any previously released version, making this version of Minecraft visually superior. Outside of that, no additional changes have been confirmed but it is rumored the team wants to make use of the DualShock 4 in some way, such as utilizing the light bar. 4J Studios has announced that the PS4 can generate worlds 36 times larger than those found on the PS3 and the Xbox 360, and in addition the viewing distance is vastly superior on the PS4. In addition, many of the skin packs bought for the PS3 version of the game will carry over to the PS4 version. In April 2014, Mojang's Owen Hill has revealed that gamers will be able to transfer their PlayStation 3 worlds to the PlayStation 4 version! Also in the works is transferring those same worlds to the PlayStation Vita version of the game. Mojang has revealed that they are officially looking into Cross-Buy support. Whether this means PS3 Minecraft owners will receive the PS4 version for free or PS4 owners will get the Vita version for free remains to be seen. While Cross-Buy support isn't enabled for PS3 to PS4, Mojang has revealed that PS3 owners of Minecraft will be able to pick up the PS4 version for only $5! Minecraft was released September 4, 2014. Minecraft disc release for the PS4 was confirmed for October 3rd 2014! Minecraft gamers worldwide rejoice! The PS4 version will include worlds 36 times larger than what you see on the PS3. Quite a nice improvement! There will be a cross buy between the PS3 and PS4 versions. Update: Apparently the game has failed the certification process at Sony and was sent back to 4J Studios, who are working on fixing and then resubmitting it. A new release date has not been announced, but the game will not see a release in August. The game will be downloadable via the PlayStation Network and will retail for the $19.99 it retails for everywhere else. It is also being rumored that the game will ship on a disc as well. Microsoft Buys Mojang -- Will Minecraft Support Continue on PS4? It's been announced that Microsoft has bought Mojang (and Minecraft) for a whopping 2.5 billion dollars! What will happen with the PlayStation 4 version of the game? Xbox chief Phil Spencer assures PS4 owners that their game will continue to be supported, stating "This is a game that's found its audience on touch devices, on phones, on iPads, on console, and obviously its true home on PC. Whether you're playing on an Xbox, whether you're playing on a PlayStation, an Android, an iOS device our goal is to continue to evolve and innovate with Minecraft across all those platforms." Excited for Minecraft on the PS4? Can't wait to play it together with your friends? Let us know in the comments and keep reading PS4 Experts for all your PS4 news! is minecraft really coming to ps4 ???? do you have to pay for the game on psn even tho i already have a Premium account? I would kinda think they would make you pay.. if they didn't that would be a bad business move on their part. Because they took time to actually make the game on a different console, you can't just expect it free. Awesome, surely gonna buy it since I've played it on the PC for 2,5 years now.. They should use the light bar to indicate what time of day it is, as long as you have crafted a clock and have it in your inventory of course. That way you don't need it in your hot bar. Super stoked for PC like MP. I hated it on PS3 which in turn made it ok to hand down to my 5 year old. Maybe Sony has legit testing criteria or maybe the minecraft programmers got sloppy. Either way hurry up and get this on the PS4! Plz let play together ps4-Pc-xobox_to mincraft ps4 stel alive !